Tottenham forward Harry Kane is in "pole position" to succeed Wayne Rooney as England's main striker, says manager Roy Hodgson. Skipper Rooney, 29, will miss the Euro 2016 qualifiers against Estonia and Lithuania with an ankle injury. Arsenal forward Theo Walcott, 26, also wants to play as a central striker. "Harry's waited a long time for his chance, but when he got his chance he scored with his first touch of the ball." said Hodgson. "It's now that we have him exclusively to ourselves. We believed in him. He's got a good career ahead of him, so it's nice he'll get an opportunity." 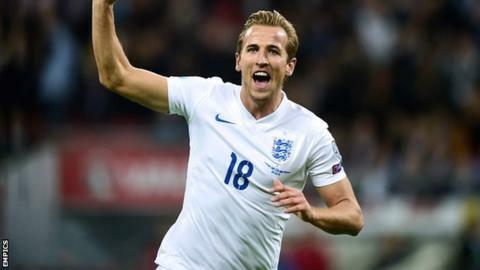 Kane, 22, has scored from the bench in each of his three England appearances, and played in last summer's Under-21 European Championships, where England went out at the group stage. Liverpool's Daniel Sturridge is still working his way back from injury and has not been selected in the England squad. There has been plenty of debate on whether Walcott is better suited to a role as a winger or a striker but Hodgson was relaxed about his position. Walcott has played in a variety of positions for Arsenal this season, scoring four goals in 10 appearances. "I don't think it's a big debate whether he starts up the centre or on the right or left," the 68-year-old said. "What we're asking him to do is what he does for Arsenal with Alexis Sanchez." England, who have already qualified for next summer's tournament as Group E winners with a 100% record from their eight games, play Estonia at Wembley on Friday before travelling to face Lithuania on 12 October. Rooney, England's record goalscorer, has not trained fully this week after injuring an ankle in Manchester United's defeat at Arsenal. But he will remain with the squad for Friday's game, before which he will receive a commemorative golden boot from Sir Bobby Charlton, whose record he beat when he scored his 50th international goal in the victory over Switzerland last month. "[The injury] is a disappointment for Wayne," said Hodgson. "Wayne is not the type of person or type of player who likes to miss a game. "It is settling down very, very well but we don't want to risk him on Friday."